We were able to find someone willing to build it for a daily charge and it was a great deal. We haven’t regretted spending the money paying someone else even one little bit. We have absolutely loved this new addition to our ranch style house. 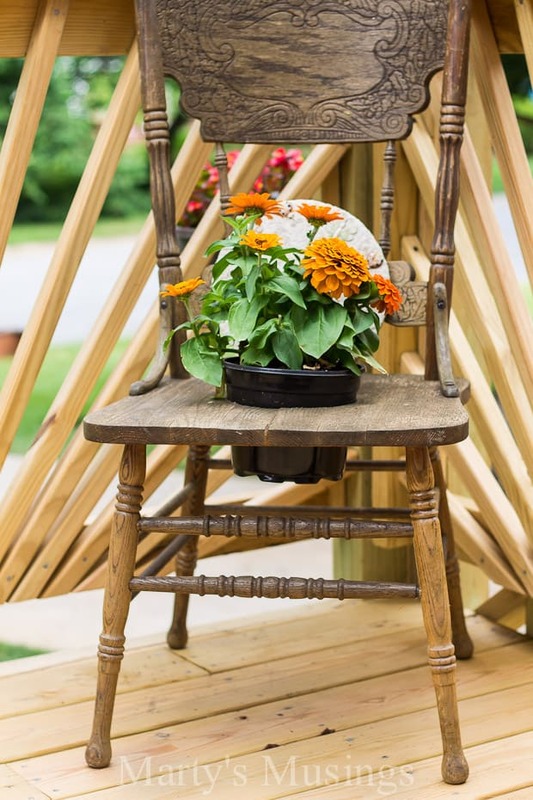 We live in the hot south and it’s common to see a porch or a deck on the front of the house. If we had unlimited funds I would have preferred a porch, which means a roof and not getting wet. But that wasn’t part of the plan and even without it I couldn’t be more pleased with the way our project turned out. 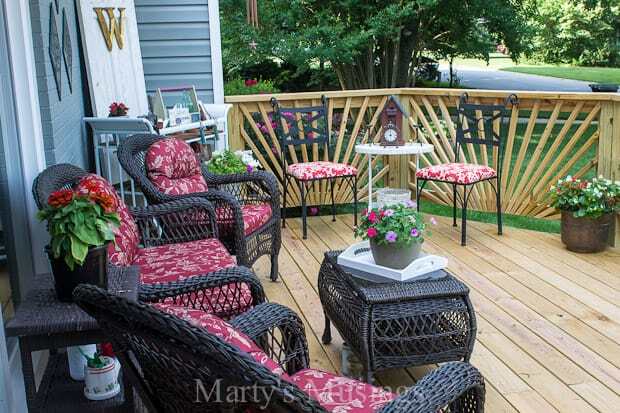 Last year when I posted our deck on one of the groups I’m part 0f I had no idea I would become involved in a particularly animated discussion on the pros and cons of decks versus porches. Everyone had their own opinion and sometimes they were not always expressed politely. Hometalk is a wonderful community to find project inspiration for everything from building, DIY, crafts and more plus there’s a community of contractors and professionals to answer questions for you. (No, I’m not getting paid, just a community I enjoy being a part of). I always try to avoid conflict in terms of social media. My reputation is more important to me than getting my point across with the whole world watching. Plus my mama always taught me if I didn’t have something nice to say I shouldn’t say anything at all! So I took the high road in the comments and only responded to the kinder ones. The funny part was watching other folks come to my defense without me saying a word! I did think it would be fun to explain some of our thoughts about this project and show you how it looks a year later! Money was definitely a deciding factor. Like most of you, we live on a limited budget. Our DIY projects are not done on a whim. Usually they involve months (and sometimes years) of conversation and research. Neither one of us gets everything we want. We compromise and usually find the least expensive option that will help us obtain our goals. No, we DIDN’T build a deck so I would have something to write about! Even though my husband laughingly says that it’s hardly true. But since we did build it you bet I’m going to decorate it, enjoy it and tell you all about it! We spent years tossing the idea around the idea and dreaming. When that dream became closer to reality we had to make some decisions. The first one involved removing the dead trees in the front yard. Wow, did this stir up a controversy! While I love trees and would have gladly saved the thousands of dollars we spent on dead tree removal it was a necessity for the trees in close proximity to our house. We’ve removed about ten on our property through the years and every time we spent that money I grimaced but it’s better than buying a new roof or car or whatever they might have landed on if they fell. 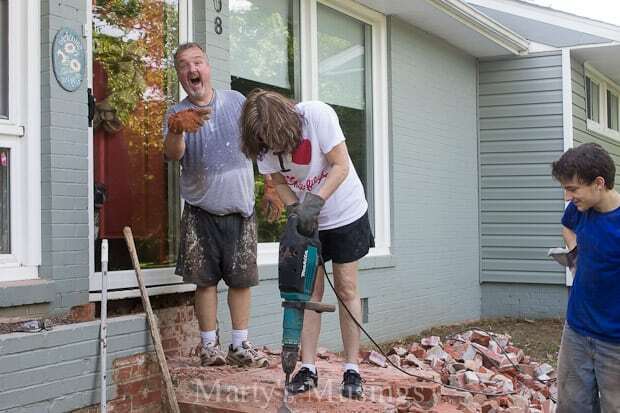 The second step was the jack hammer demolition of the front stoop and stairs so that the deck could go right over the stoop itself. Fun times. Not. 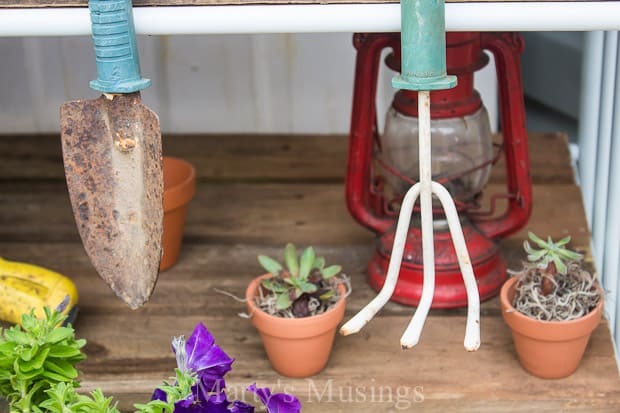 Finally, last year I couldn’t wait to show my readers the finished project in all its glory with my yard sale finds, including my $15 changing table turned DIY Garden Cart and a few curbside treasures thrown in. This year I took the old door down. I really loved it last year but somehow the rustic look just turned dingy and bad first impression. I’m okay if everything doesn’t work. No one gets it right all the time. After waiting the necessary time for the wood to cure, Tim then stained the deck and we love the way it makes the deck blend into the house. (You can read another lively discussion on our choice of color over on Hometalk!) Before we just had a stoop and I really had no place to decorate for each season. Not anymore! Last year Tim planted roses for non gardeners like me. Knockout roses are just amazing! Tim is the gardener in the family and I’m the waterer and pruner of dead buds! The one thing I wanted most this year was the ferns. Love them! Our home has so much more curb appeal now. 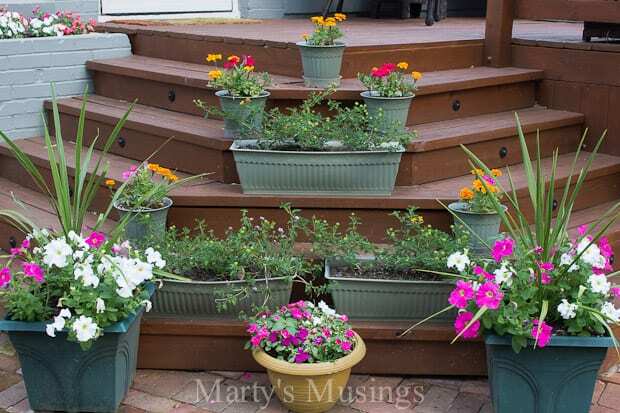 I love the way the stairs lead straight to the front door and the flowers just make me smile! Somehow I think he got the best job with just planting and I got the worst with watering pretty much every day and picking off the dead blooms. We might have to switch next year! My front door welcomes all with its cheery Japanese Kimono color and makes me happy as well! 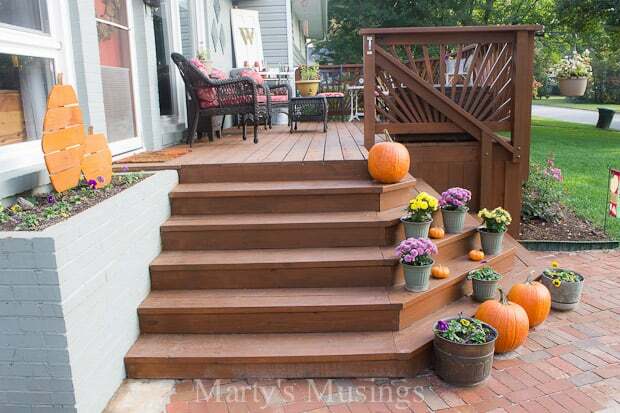 Our answer to the uproar of whether it was right to build a deck on the front of a house? We’re enjoying every second of the view! THIS IS NOT OUR DREAM HOME. Are you living in yours? Most of us are not. If I had wads of cash and unlimited time it would be different. Accepting reality and living contented is my goal and it’s why I share our journey, not only through our DIY projects, but through our family story. 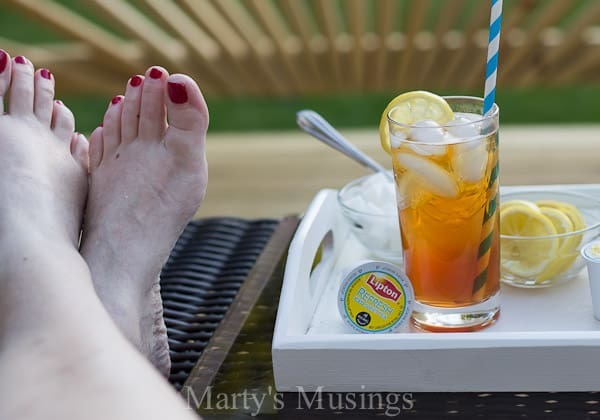 At the end of the day when we’re relaxing on our deck with our feet up, holding hands and talking through the details of the day, we love every inch of our deck. It’s more than just a DIY project. It’s proof of hard work, patience, commitment, team work and a whole lot of love. Won’t you join us along the way? 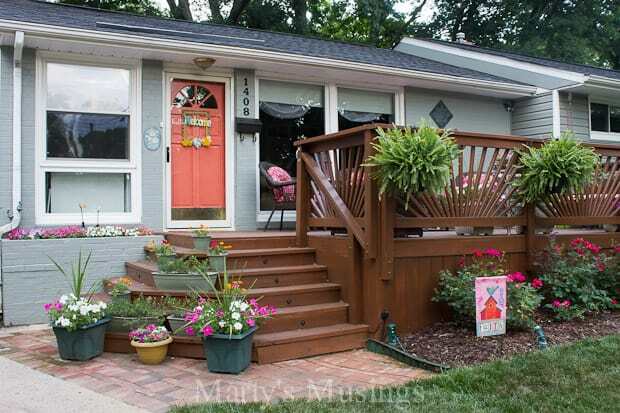 I’d love to know whether you’d rather have a porch or if a deck would suit you just fine! 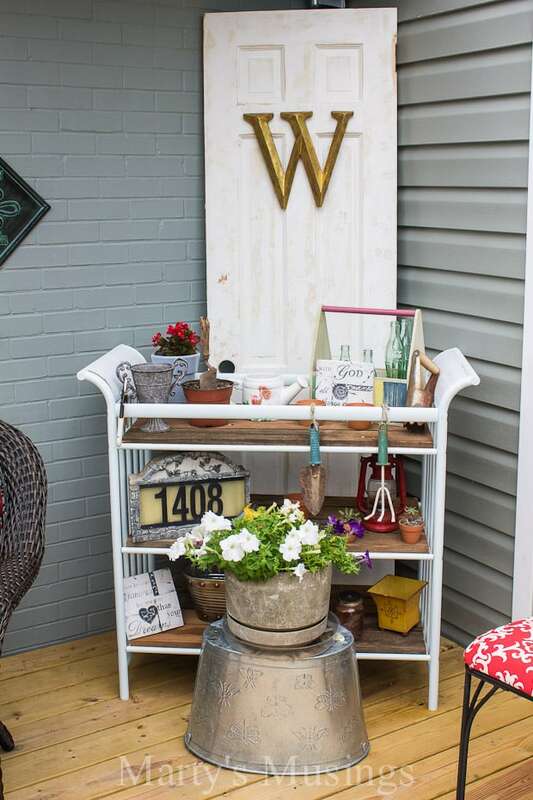 See more of this year’s budget decorating and all the latest yard sale and trash to treasure finds (or last year’s here). I find it very interesting how different parts of the country have different styles. I don’t think I’ve ever seen a front deck up here in the Northwest. 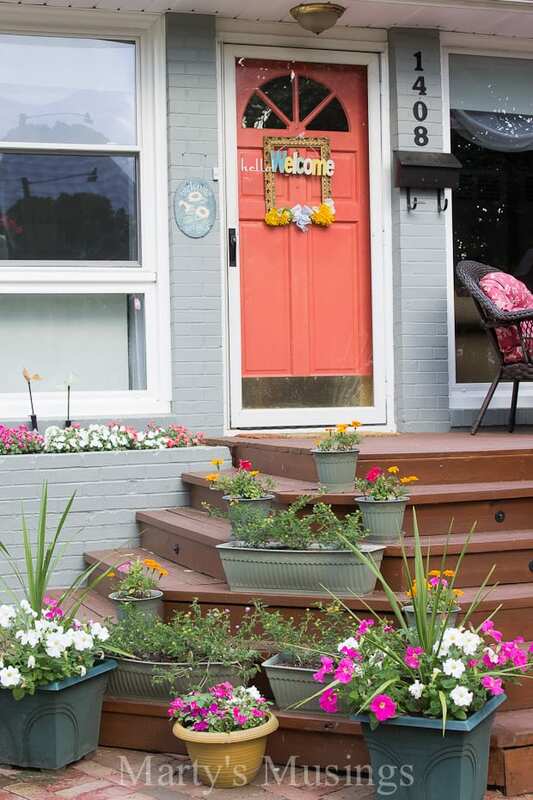 A few houses have front porches, but not a lot. We mainly have front steps and stoops . . . with our decks and patios in the backyard. 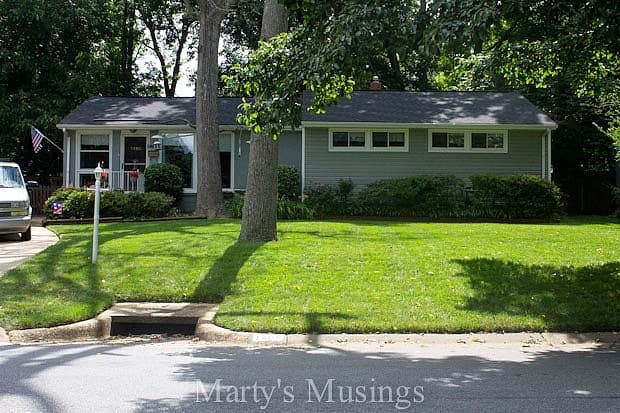 It also looks like you live on a quiet, tree-lined, houses-spaced-apart street, which would make a front deck more appealing than on a small lot in the city, I think. I live in the Pacific Northwest and a lovely deck is being built on the front of our house as we speak! My kitchen is in the front of my house, so having a deck on the back is just not practical. I can’t imagine carrying food and drink through the bedroom to get to the deck! 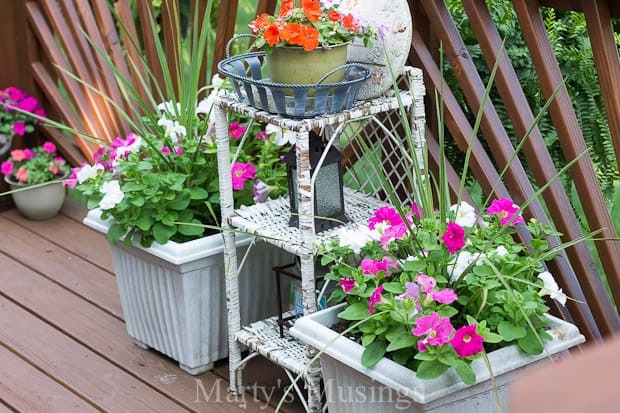 I love the way your spindles are arranged…how unique is that!! Enjoy your deck as will we. I left a comment on your newest Hometalk post. A nice one (I think). I do leave comments, but I rarely read others… it just annoys or makes me sad for humanity (well, I might be exaggerating a little). I admire the guts it takes to post there. Why on earth do people think their opinion of what’s a better choice than yours, and how much better they would have done it, is one that needs to be aired? My husband shakes his head in disbelief when I tell him that yes, on a home decorating site there are still mean and snarky trolls. He thinks that only happens on political sites! Oh well. 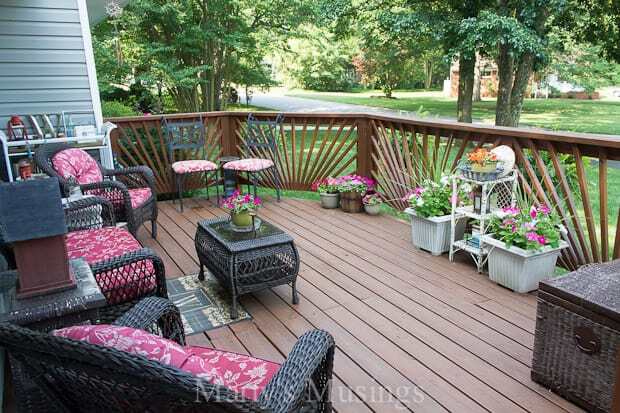 You have what looks to be a comfortable and pleasant deck. Enjoy! I remember your deck on “Hometalk” and some of the comments. I just don’t understand why people have to make negative comments. If something is not your taste, just move along. I think it just makes them feel superior. Anyway, I love your deck. It looks very nice and if you like it that’s all that matters. I just repainted my tub, but I’m hesitant about putting it on Hometalk. I’ll tell you I would take either a porch or a deck. All I have is a walkway from my side man door on the garage across to my front door. 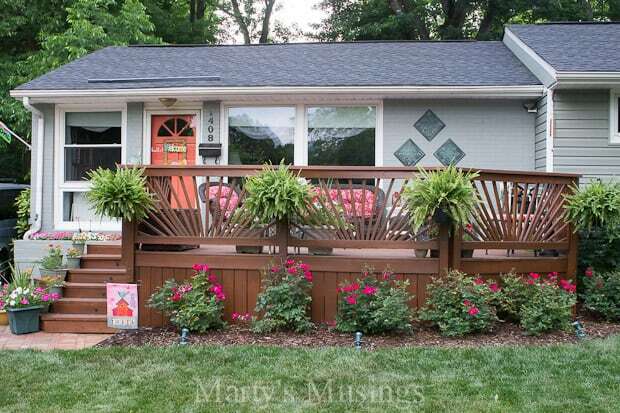 It’s better than what we originally had, but I would love a porch or deck that is covered. Enjoy your deck and let the others be envious. 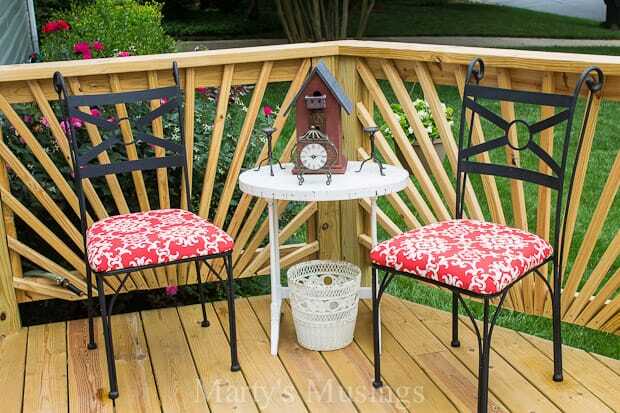 Love, love the deck. We have a boring ranch front as well and I want to add on a deck but I’m going to wait and do my screen porch and patio out back first. Thanks so much Gina! We’ve lived in our home 26 years so some projects take a long time! So very pretty. About 5 years we had a back yard deck built from Trex decking. Very Expensive. But so easy to maintain. Just mop and all done. Hi, Pamela. We would have loved a deck with Trex but you’re right, it is so expensive. Enjoy yours and well just be envious! Have a great day! I have a 1970’s Ranch Style Home here on the Prairie of Kansas!!! 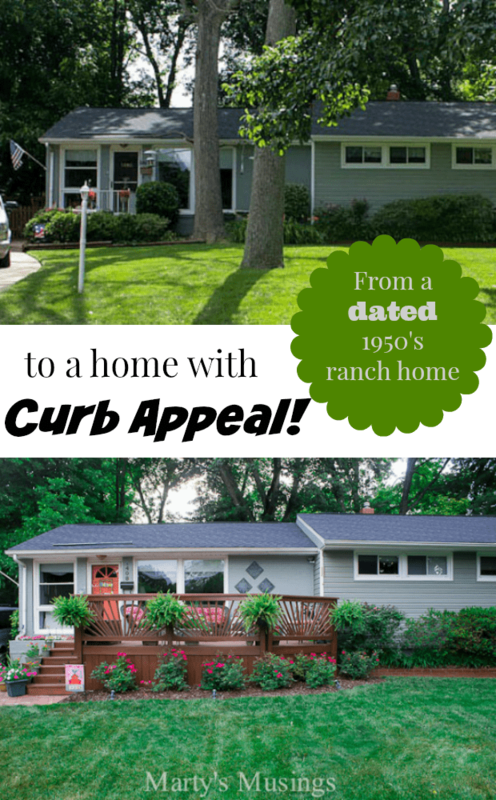 I adore what you did to your Ranch Style Home, dear one!!! In my book, I’d say you’ve done an amazing job!!! LOVE all the out~of~doors decor!!! 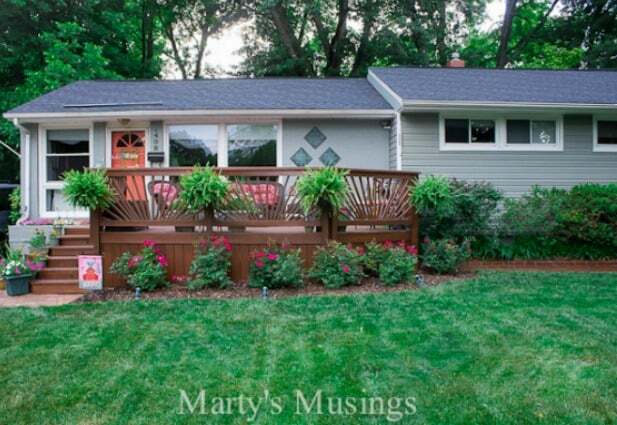 I LOVE everything about your front porch Marty!! FABULOUS! Awww. Thanks Christine! We have enjoyed it so much, but especially when the weather turns cooler. Summer is pretty rough during the day. Looking forward to working with you and Behr again this year! This is really nice but I prefer the before. The deck makes it look like a backyard. Hi, Robin. Love your running lights! We have a deck built around a tree in our backyard. You can see it in this post: https://www.martysmusings.net/2014/06/spending-time-with-family.html We definitely believe in doing the things that work for our family, whether or not they’re in style or not! I hope you’ll enjoy visiting my blog! Instead of a covered porch, we built a 3 season sunroom. I would have preferred a covered porch that wrapped around the house, but as you say that involves a roof and lots more money. 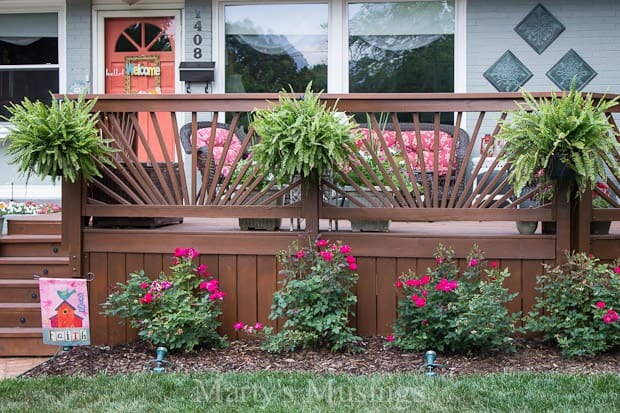 We built a deck in stages that started with 20 feet on the west side, then wrapped around a large white oak at the sw corner and met up with the deck on the south side. Last, I added to the south deck and now we have a deck that wraps around the entire west side (32′) and the length of the south side (53′). Lots of room to move my houseplants out in the spring and for the cats to lounge around. Lots of privacy since we live in the woods on a bluff overlooking the Cuivre River. You could always add a roll out awning if it gets too hot in the summer and it would also keep you out of the rain. They also have screened versions that would keep bugs out. Hi, Dorlis. 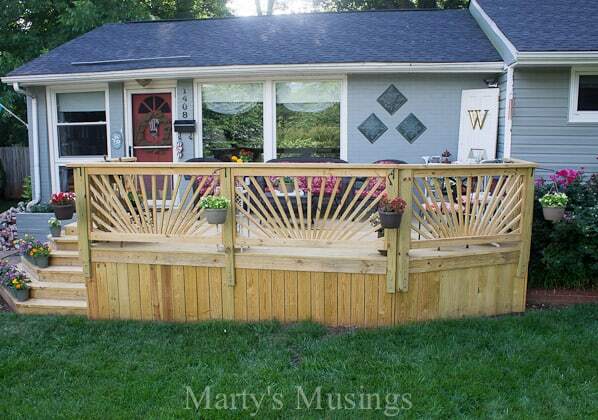 Your deck sounds amazing! Thanks for the suggestions. We just don’t like the look of the awning and choose to sit out late in the day or early in the morning on the weekends. It’s also just a beautiful way to welcome us when we come home because we don’t have a garage! I hope you’ll enjoy visiting my blog!